By Tommy Goudge (September 12, 2013) – The much-anticipated 9th annual Canadian Sprint Car Nationals take centre stage at Ohsweken Speedway this weekend, with close to eighty Sprint Car drivers from all over North America expected to compete for the top prize of $12,000. 1 – Drivers who’ve qualified for all 8 Canadian Sprint Car Nationals A-Features (Dustin Daggett). 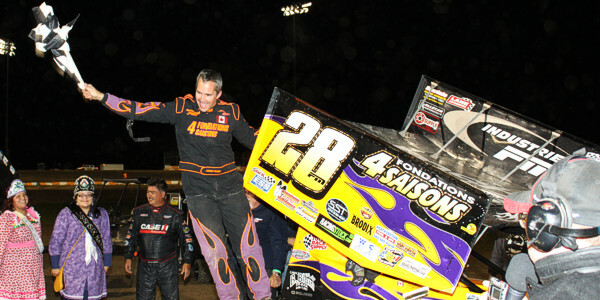 2 – Number of drivers who have won the Canadian Sprint Car Nationals without winning a heat race on the same night (Kenny Jacobs 2005, Steve Poirier 2006). 6 – Top 5 finishes at the Canadian Sprint Car Nationals for Steve Poirier, the leader in that category. 13.308 – The Canadian Sprint Car Nationals time trial record (in seconds), set in 2012 by Chris Steele. 19 – First-time competitors in the Canadian Sprint Car Nationals in 2012. 20 – Number of American states (14) and Canadian provinces (5) represented at the Canadian Sprint Car Nationals since 2005, plus New Zealand (1). 21 – Drivers who have recorded Top 5 finishes in the Canadian Sprint Car Nationals. 26 – Cars running at the finish of the 2011 A-Main, a Nationals record. 27 – Drivers who have won heat races at the Canadian Sprint Car Nationals. 34 – Possible number of cars starting Saturday night’s A-Feature, if all provisionals are needed. 35 – Number of Canadian drivers who attempted to qualify for the 2012 event. 35 – Feature lap in which Wayne Johnson ran his fastest lap time of the race in 2011. 40 – Drivers who have recorded Top 10 finishes in the Canadian Sprint Car Nationals. 51 – Number of drivers who have already filed entries for the 2013 Canadian Sprint Car Nationals. 70.9 – Average number of entries for the Canadian Sprint Car Nationals over the first 8 years. 81 – Number of Canadian Sprint Car Nationals A-Feature laps led by Steve Poirier, who tops that category. 90 – Drivers who have qualified for at least one Canadian Sprint Car Nationals A-Feature. 204 – Total number of drivers who have competed in the Canadian Sprint Car Nationals. $12,000 – The winner’s share of Saturday night’s Canadian Sprint Car Nationals purse. The Canadian Sprint Car Nationals weekend will kick off with a Test & Tune session on Thursday, September 12, while racing will commence Friday, September 13 with the “Night Before the Nationals” presented by Burger Barn, and the 9th annual Canadian Sprint Car Nationals presented by Arrow Express on Saturday, September 14. This year’s “Night Before the Nationals” includes Twin 15 lap features for the Sprint Cars, plus the TJSlideways.com Ohsweken Shootout, Dave McLeod Memorial “Mr. Sprint Car Challenge” 1 on 1 match races, and the HRW Automotive Mini Stock division with a 20 lap feature. Each Twin 15 winner will be guaranteed starting spot in the Canadian Sprint Car Nationals A-Feature. The TJSlideways.com Ohsweken Shootout features drivers who have qualified from the Empire Super Sprints, Patriot Sprint Tour, and Southern Ontario Sprints challenge events held at Ohsweken in 2013, the Corr/Pak Merchandising Sprint Car feature from August 9, plus the top drivers from Sprints on Dirt and the National Racing Alliance. 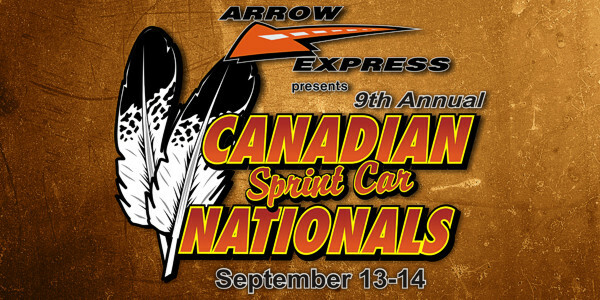 The 9th annual Canadian Sprint Car Nationals will include group time trials, 6 heat races, 3 B-Main races, a Dash race for the heat race winners to determine the top 6 starting positions in the A-Feature, the 15 lap “Little Feature”, and the 35 lap A-Feature which will pay the winner $12,000 from the lucrative purse. The Affordable Towing & Recovery Thunder Stocks will be the support division for the Sprint Cars on Saturday, September 14. Official affiliate sanctions for the 2013 edition of the Canadian Sprint Car Nationals include Ohsweken’s weekly Corr/Pak Merchandising Sprint Car division, along with the Southern Ontario Sprints (SOS) tour, the Michigan-based Sprints On Dirt (SOD) series, the Ohio-based National Racing Alliance (NRA), and the New York-based Empire Super Sprints (ESS) series, and Patriot Sprint Tour (PST). 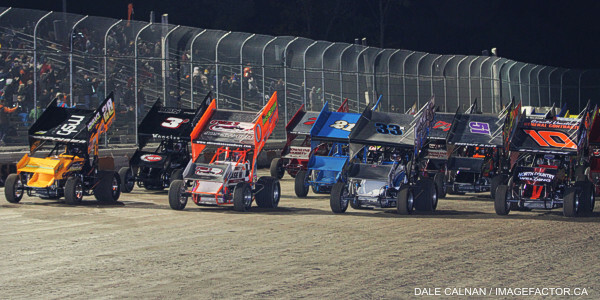 The Canadian Sprint Car Nationals has been the annual season-closing event at Ohsweken Speedway since 2005, and brings together teams from several affiliated sanctioning organizations in the area, plus teams and drivers from all over North America. The event has drawn an average of 71 entries for the 8 previous editions, with a total of 204 different drivers taking part from 14 American states, 5 Canadian provinces, and New Zealand. Kenny Jacobs of Holmesville, Ohio won the first Canadian Sprint Car Nationals feature in 2005, followed by Steve Poirier from Saint-Mathieu-de-Beloeil, Quebec in 2006 and 2007, Mustang, Oklahoma’s Wayne Johnson in 2008, Shane Stewart of Bixby, Oklahoma in 2009 and 2010, Sam Hafertepe, Jr. from Sunnyvale, Texas in 2011, while Steve Poirier became the first 3-time winner in 2012. 51 drivers have already filed entries for the 2013 edition of the Canadian Sprint Car Nationals, including former winners Wayne Johnson, Shane Stewart, and Steve Poirier. First-time entrants include Australian champ Brooke Tatnell, and American Sprint Car Series National Tour driver Brad Loyet from Missouri. Advanced reserved seat tickets are now on sale for the 9th annual Canadian Sprint Car Nationals on Friday, September 13, and Saturday, September 14. “Night Before the Nationals” presented by Burger Barn general admission tickets for Adults are just $12, while general admission for seniors and students is $10, and kids age 12 and under are admitted FREE! Spectator gates open @ 6:00pm, with hot laps scheduled for 6:50pm, and the first race taking the green flag at 7:30pm this Friday, September 13! Reserved seat tickets are available in the top 6 rows of all sections in the main grandstands for the Canadian Sprint Car Nationals presented by Arrow Express on Saturday, September 14, along with all of sections F and G. Saturday reserved seat tickets for Adults, Students, and Seniors are $41.50, while Saturday reserved seat tickets for Kids age 12 and under are $6.50. General admission tickets for Saturday are $25 for Adults, Students, and Seniors, while general admission tickets for Kids age 12 and under on Saturday are just $5! Spectator gates open @ 3:00pm, with Time Trials scheduled for 6:05pm, and the first heat race taking the green flag at 7:30pm this Saturday, September 14! Please visit www.OhswekenSpeedway.com and check out our new system for online ticket sales, call 1-855-448-3478, or purchase your tickets at the track on race nights with your Visa, Mastercard, or Debit card! Plenty of unserviced camping space is once again available at the speedway all weekend for a nominal one-time fee of twenty dollars. The pit area washrooms and concession stand will also be open twenty-four hours a day during the Nationals, and the concession will feature breakfast and lunch menus. The Brown Auto Service trailer will be at Ohsweken for all 3 days of the Canadian Sprint Car Nationals weekend to supply Sprint Car teams with tires, fuel, and parts. Call them at 519-752-9531.